Welcome to episode two of Measure and Stir’s Magical Mixological Journey in the Land of the Rising Sun(tm). Today, we are visiting Bar Tender in Ginza. 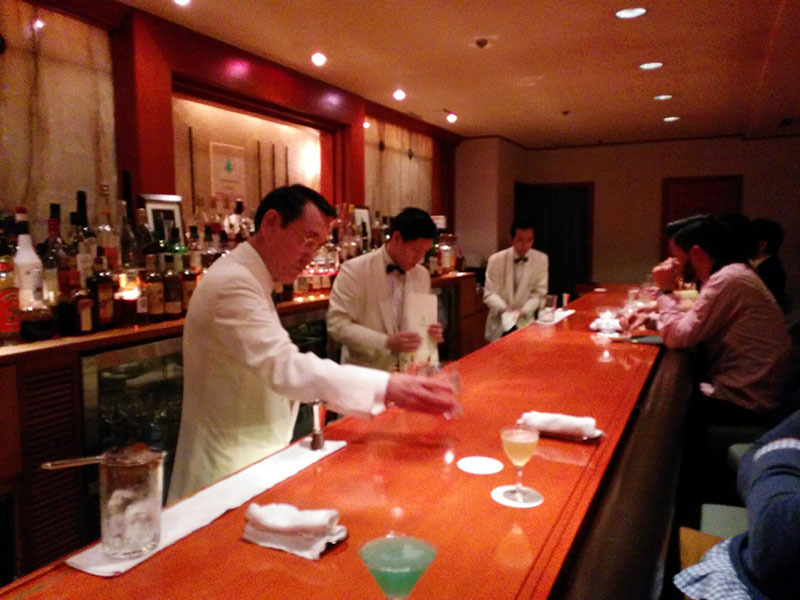 Ah, Uyeda-san, the grandfather of Japanese bar service. Kazuo Uyeda has made his reputation as the best bartender in Japan and the Magician of Color by winning many cocktail competitions. An enterprising cocktailian would be remiss to have missed his book, which explains his drink philosophies and contains instructions on such details as how to grip a shaker, how to hold a spoon, and how to arrange the bottles on the bar in front of the customer before making his drink. Uyeda-san is also the inventor of the famous “hard shake“, a shaking technique designed to maximize aeration and flavor. You take the bottle down from the shelf. You twist off the cap. The liquid streams into the glass. Every action is natural and the result of focused concentration. The bartender never shows off and yet nothing is accidental. Your job as a bartender is to make good cocktails, but it is also important to make them look delicious. To refine your skills, you have to closely study not only the flavor but also the movements that go in to making a cocktail. You have to practice the basics and focus on making your movements flow while presenting a clean, neat image. The intent isn’t to look cool bur rather to refine the entire cocktail drinking experience for the guest. herein lies the biggest difference between an amateur making cocktails at home and a professional bartender standing in front of the bar doing his job while all eyes are on him. 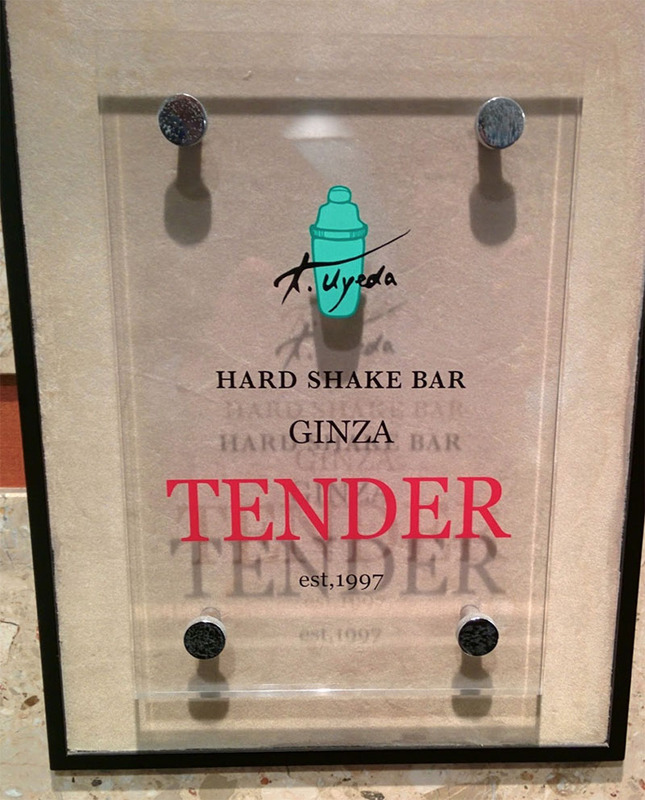 Tender serves very classic drinks, but the menu is also peppered with Uyeda-san’s original and award-winning drinks. Uyeda’s palette of ingredients is straight out of the seventies, and he uses many ingredients such as blue curaçao, midori, and green tea liqueur to achieve a very specific appearance. His consideration of cocktail colors has earned him the name “the magician of color.” In his book, he explains how he created a drink specifically to match the color of a lake near a cocktail competition that he attended. The service at Bar Tender is excellent almost to the point of parody. To be honest, the drinks themselves are a little bit dated, but the honor of being served a drink by such a prestigious and important bartender as Uyeda-san more than makes up for it. He has carefully orchestrated every aspect of the customer experience; as he works his movements are so crisp and consistent that it feels like a ritual. He and his staff all wear white coats, which they somehow manage to keep immaculate even with so many brightly colored spirits flying around. Because Uyeda-san’s English is not so great, he showed us the entries in his book that pertained to the drinks that he ordered. It greatly enhanced our appreciation to read about the history and thought process that went into each drink. The most noticeable feature of this cocktail is probably the coral frosting on the outside of the glass. Decorating the rim of the glass with colorful liqueurs instead of a fruit juice is a style that has been around for a long time, and this is an extension of that. The first cocktail to popularize this style was the City Coral. Using this style was a large part of my original intent in creating this cocktail. There is a road spectrum of colors to choose from, depending on the liqueur you use, but blue curaçao and grenadine (which is red) were two colors that did not lose their intensity when combined with salt, so I limited myself to these two ingredients. I combined this style with various cocktails, and found that blue was the best match. Also, please note that while I say they drinks are slightly dated, that is not to detract from their excellence. They are perfectly made, and there is still much that is of interest to a seeker of novelty such as myself. 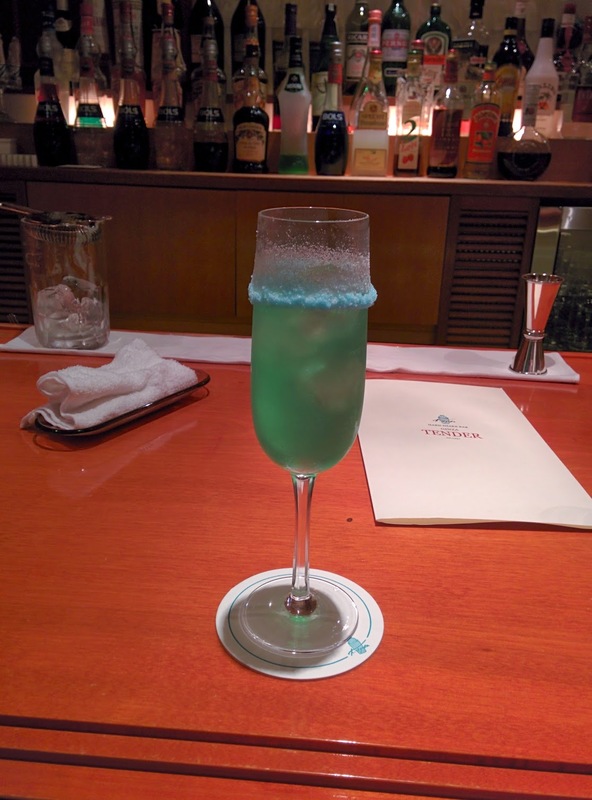 In fact, it is impressive that Uyeda-san can make midori palatable at all. The Shungyo (which means spring dawn) is a typical Japanese-style cocktail designed to evoke one of Japan’s four seasons. In fact, it wouldn’t be an exaggeration to say that it was through creating these cocktails that I succeeded in establishing my own unique style. When creating a Japanese-style cocktail, spring is typically represented by a soft hue, summer by primary colors, fall by misty color combinations and winter by warmer colors. Japanese ingredients are used too, such as sake, shochu, umeshu (a plum liqueur) and green tea liqueurs. I decided to use sake in this cocktail. I started by choosing a name. I wanted to evoke an image of an early spring sunrise, and to do this I planned to incorporate cherry blossoms. I used cherry blossom petals that were salted and then rinsed in warm water to dial back the saltiness. Green was the obvious choice to bring out the beauty of the flour petals. 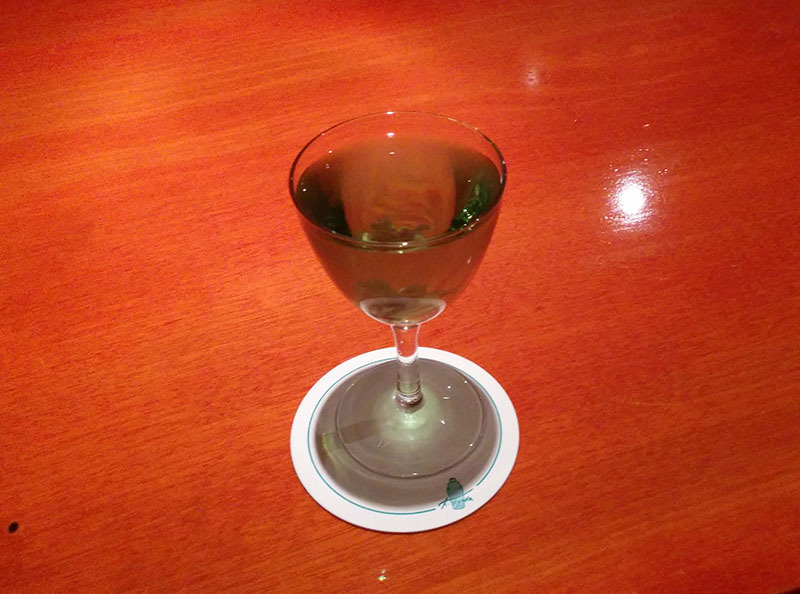 Menthe or midori were too bright for an early spring morning, so I chose a green tea liqueur. I used vodka as a foundation to push the flavor of the Japanese sake to the fore. And, while there is more vodka in the recipe, this is essentially a sake-based cocktail. It isn’t often that one can recount a cocktail experience in the bartender’s own words! If you are looking for an avant-garde drink, you might want to skip Bar Tender, but if you are a cocktail fanboy like me, then Tender in Ginza should be on your list. Categories: excursions | Tags: alcohol, bars, bartending, booze, cocktail, cocktails, craft cocktails, drinking, drinks, Ginza, japan, mixed drinks, mixology, spirits, tourism, travel, uyeda | Permalink. It must be an amazing trip! The City Coral reminded me of the MxMo you hosted. Keep the knowledge flowing, Saúde! hi, do you have an address/website for Tender Bar? I am heading to Tokyo next month and would love to go but struggling to find anything about it!